Enzymes play a crucial role in all living organisms, being the best chemists that nature has “invented” (from the evolutionary viewpoint, of course). In the last decades these catalysts started to be used more and more in industrial, biotechnological processes, due to the fact that all chemical processes which normally need extreme conditions (high temperature and/or pressure, extremely acidic or alkaline media, etc.) can be done in much milder conditions, at temperatures of 25-40 °C, almost neutral pH, and in water as solvent. Considering the huge number of enzymes known so far and the new ones which are constantly being discovered and characterized in organisms all over the phylogenetic tree (e.g., extremophiles, Archaea, etc), it is no wonder that biotechnologies that use them extensively have grown exponentially in the last period. In this context, I was delighted to read “Methods to Determine Enzymatic Activity”, edited by Alane Beatriz Vermelho and Sonia Couri, which comprises a nice collection of 13 reviews, all of them from Brazilian scientists, dealing with these topics. Each chapter presents in a very nice manner the main reaction(s) catalyzed by the considered enzyme, its sources, purification, characteristics, followed by the detailed description of the assay methods used to determine the activity (as well as inhibition/activation) of these enzymes. Many representatives are taken into consideration, such as pectinases, peroxidases, enzymes with chitinolytic activity, cellulases, amylases, xylanases, lipases, phenoloxidases, transglutaminases, keratinases, peptidases (mainly serine and metallo-proteinases are considered), tannases and ureases. Most of these enzymes have important applications in the food, textile, leather, biofuel production, pharmaceutical, cosmetics, fine chemicals, biomaterials, paper/cellulose, and detergent industries. The Editors and the authors did an excellent work in presenting in an exhaustive and highly professional way the state-of-the-art in all these field. I warmly recommend this eBook to students, researchers and scientists from diverse fields, as due to the simplicity in which the material is presented, they will be able to resolve in a quick way some research problems related to assay methods of enzymes with many applications in biotechnology. The aim of this book is to provide an updated revision of the most important and simple methods to analyze enzymatic activity. 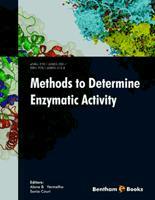 Qualitative and quantitative methods for the industrial enzymes are described. Microbial enzymes are increasingly replacing conventional chemical catalysts in a range of industrial processes in industrial since the process of biocatalys is ecologically correct. Moreover, the conditions to obtain and optimize the production of enzymes are easily controlled in bioreactors and the microorganisms can also be manipulated genetically to improve the desirable characteristics of a biocatalyzer. The main industries that apply microbial enzymes are: the food, textile, leather, biofuel pharmaceutical, cosmetics, fine chemicals, biomaterials, paper and cellulose and detergent industries. In this context a comprehensive overview of the methods used for enzyme detection would be useful. The book contains 13 chapters and presents the main methods to analyze the activity of pectinases, peroxidases, chitinases, cellulases, amylases, xylanases, lipases, phenoloxidase, transglutaminases, keratinases, peptidases, tannases and ureases. The 1st chapter of this book is about the pectinases, one of the enzymes presently gaining much attention in the fruit and textile industries. This chapter describes the current state of knowledge of the main assays used to quantify pectinolytic enzymes and their activity. The second chapter focuses on the peroxidases. These enzymes are ubiquitous enzymes that catalyze the oxidation of lignin and other phenolic compounds at the expense of hydrogen peroxide (H2O2) in the presence of a mediator. They have been classified into many types based on their source and activity. One of the major application of the peroxidases is in the bioremediation processes. In the 3rd and 4th chapter, the chitinases and cellulases are discussed. Chitinolytic enzymes are gaining importance due to their biotechnological applications. Particularly, chitinases are used in agriculture to control plant pathogens.The main methods for the detection and measurement of chitinolytic activity will be presented. Cellulase has been used in the bioconversion process of lignocellulosic materials into bioethanol and biobased products, within the biorefinery concept. Also, cellulases have been widely used in various industries such as the textile, food, beer and wine, animal feed, pulp and paper industries. This chapter describes the current state of knowledge on assays for the glycoside hydrolase complex. The 5th chapter describes enzymes the detection methods for all types of amylase, a group of important industrial enzymes with applications in food production, and the production of sugars from starch. Xylanase and lipases detection methods are respectively in the 6th and 7th chapter. Xylanases play a vital role in depolymerizing xylan, the major component of hemicellulose. These enzymes have been used in traditional fields such as food, animal food and paper industries. The use of xylanase in producing sugars and other chemicals from lignocelluloses in recent years is increasing. Lipases hydrolyze triacylglycerols to fatty acids, diacylglycerols, monoacylglycerols and glycerol and under certain conditions, catalyze reverse reactions such as esterification and transesterification. They are used in various industries such as: the food, waste water treatment, cosmetics, biodiesel, pharmaceutical and detergent industries, as well as in biofuels. The 8th chapter is about phenoloxidase, which are copper enzymes that catalyze the oxidation of phenolic compounds. Transglutaminases are focused in chapter 9th. They are biological “glues” capable of catalyzing acyl transfer reactions by introducing covalent cross-links between proteins, as well as peptides and various primary amines. Their most important use is in the food industry. Qualitative and quantitative methods for peptidases and keratinases are described in the chapters 10 and 11 respectively. The proteolytic enzymes account for 25% of the industrial enzyme market and present multiple applications including the food and detergent industry, cosmetic, animal food, leather depilation, textile Pharmaceutical sectors. Lastly, the chapters 12 and 13 report the major methods used for tannases and ureases. Tannases are acyl hydrolases that act on tannins. The major uses are in the production of gallic acid and glucose, beer processing and clarification of juices and the ureases catalyze the hydrolysis of urea into ammonia and carbon dioxide. They are mainly important in agriculture, medicine and clinical analysis. We would like to thank the authors for their excellent work, their dedication and updated information.